Today we are interviewing not one, but two people! 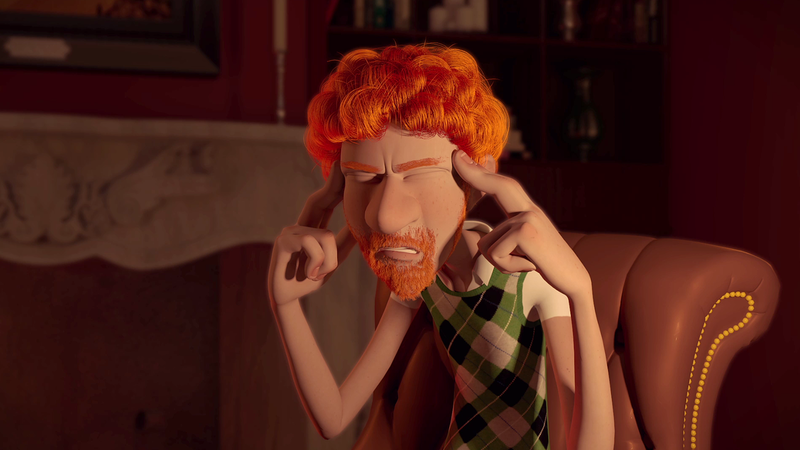 Xin and Florent are the makers of "The Answer", a short animation film using Animschool's Malcolm Rig. 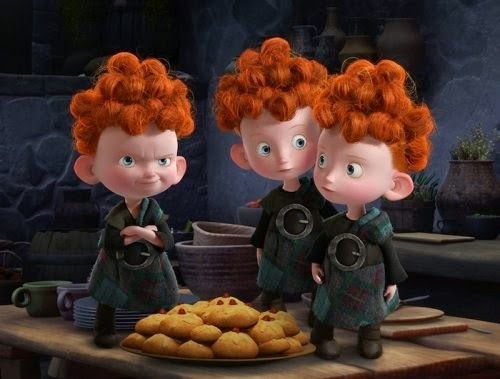 Both of them are now applied to our 3D Animation Program. Lets begin the interview! Hi guys! Can you start by telling us where you’re from, your experience with character animation and background? Xin: Hi, I'm Xin. I'm from Beijing. I always wanted to be a animator since I was a kid and they told me knowing how to draw is going to be benifical even if I want to be a 3D animator in the future. So I started my professional Fine Art training since I was in primary school. Since then I learn Fine Art for nearly 10 years before I went to Teesside University to get a Bachlor of Art Degree in Character Animation in the UK, where I gained a lot of 3D Generalist skills as well as animation skills. Florent: I am from Toulouse, in France. I have always been a big fan of animation and video games but for some reason I thought about it as a possible career pretty late and I studied different subjects (including food processing...) in the end, after graduating in computing science in France I decided to move to England and learn animation. 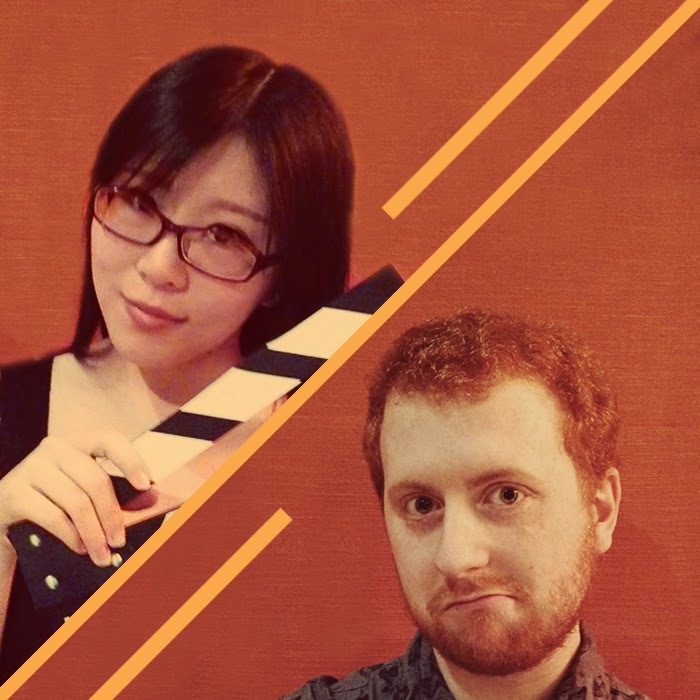 We both studied at Teesside University, in England, where we graduated from Bachelor of Art in character computer animation. After our studies, we both got hired as animation interns by Ubisoft in Newcastle-Upon-Tyne. We are now still working at Ubisoft and we decided to study at Animschool on our free time to learn more about animation as our University course was very oriented on CG generalist skills. How did the idea for the script came up? Who was in charge of what in the short? Xin: Of course, it is slightly based on real events. My partner Florent was shaving in the bathroom with his electric razor, and some minutes later, he came back in the room with a half shaved beard and his razor which was out of power and the cable was nowhere to be found. 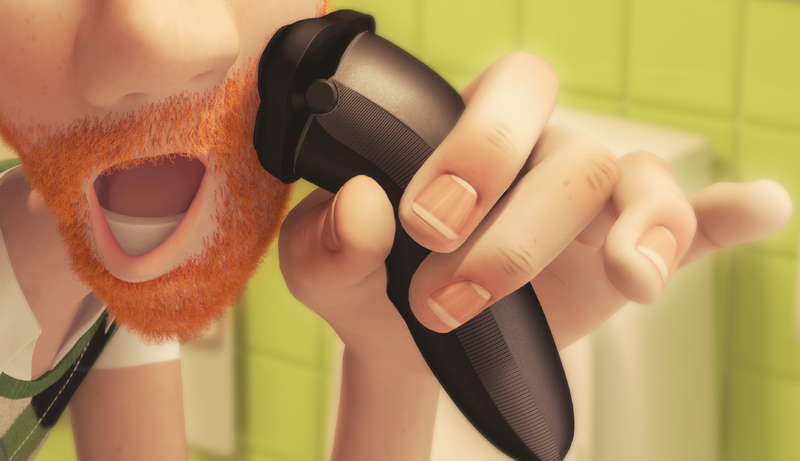 With this idea in mind, we also wanted to find an idea about how he could finish up shaving in a funny way. I remembered reading a famous self-helping book based on “The law of attraction” and which marketing is based on a “secret” linked to many historical figures and conspiracy. And so we decided to make a parody of it. Florent: We shared the different tasks according to our skills and what we wanted to do. Both our dreams were to become character animators after university so we evenly shared the animation. For the pre-production, after defining our story and getting some rough shot ideas, Xin draw an amazing storyboard (see panel). Xin's storyboard was so clear we even used it as the main reference for the environment design. We both modelled and textured environment and assets. Xin took care of Malcolm rig modifications, the 2D/motion graphics and compositing Florent did the shading, the lighting and the rendering. Can you tell how much time did you guys spent per day on it and how long did it took from start to completion? We started over the summer to be ready to animate at the start of the academic year so it took a part of the summer and half of the academic year (because we had another project), so around 5 months spread on a year. What did you guys think of the Animschool Malcolm rig? Did it meet your expectations on the production of the short? From the start, this project goal was to produce the best character animation we could make to showcase our animation skills. To get the best results, we had to give up the idea of using our own character. Quickly, we decided to use a Free Rig which allow us to have maximum performance of the character animation. 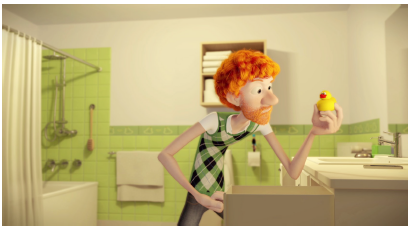 We choose Animschool's Malcolm Rig due to its flexibility after we saw many great animations including a short animation called Mistakes on the 11 Second Club website. The runner-up of March 2012 gave us a great idea of how flexible and controllable the Malcolm Rig’s hands are. The Malcolm Rig has an amazing facial rig. The eyebrows and mouth in particular allowed us to have greater facial animation without being limited by the rig itself. Of course, the body rig of Malcolm is fantastic too. The controllers on his limbs enable us to have great line of actions during the animation. Can you share the main process for the character animation and model modification? Video Reference Recording – Record video references of ourselves for the animation. 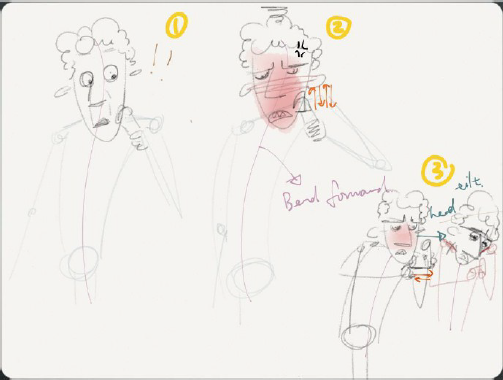 Character Animation Thumbnail – Decide the character’s actions by drawing out the storytelling poses. 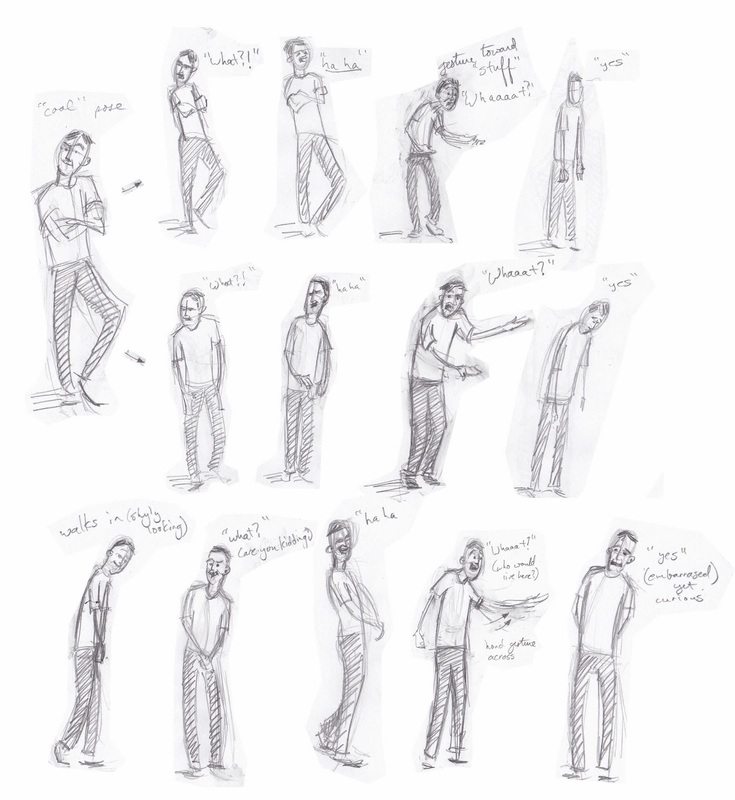 Blocking Animation – Blocking of the storytelling poses of the animation and establish the rough timing of each movements. Spline Animation – Change stepped animation curves to spline curves. Polish Animation – Add textures to the spline animation and clean the curves in Graph Editor. We also gave him a shirt collar to add some detail. 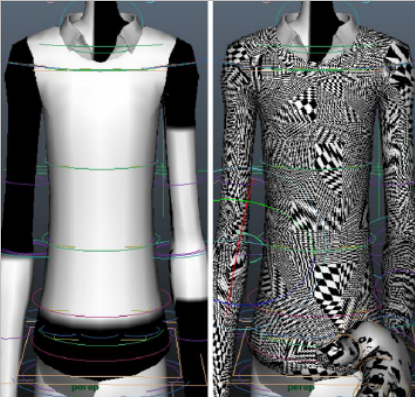 The collar is animated by 6 blendshapes to reduce shoulders intersection once animated. After doing some research, Xin found an article from a blog called Anim Bizz, talking about how to transfer UVs after rigging. A "Shape Orig" node includes the information of the character before rigging. Therefore, a UV transfer can be applied to this and it allowed us to UV map Malcolm's body. For the hair, we wanted the non-dynamic hair system since dynamic hair is not necessary and it requires more work to do with the simulation which is way too complicated for us. Xin followed a course talking about hair system on DigitalTutors.com and had a basic idea how to build up the hair system with curves. The idea was to create curves where we wanted the hairs to be and apply hair systems on them. Three layers of curves were created to had more realism and volume to the hair. For the Beard and Eyebrows, we used the Maya Fur system. ￼￼What were the main challenges for this short? Hahaha... Everything. We basically had no experience using Maya for more than animating a basic walk cycle and lip sync exercise for University. Every aspect was new and we were constantly doing research and learning: how to rig, how to shade, light and render, how to use hair and fur .. and well .. how to animate. Thanks to a lot of great ressources online (including AnimSchool Youtube channel, Digital Tutors, countless blogs, univeristy feedback) we managed to get to the result we wanted. 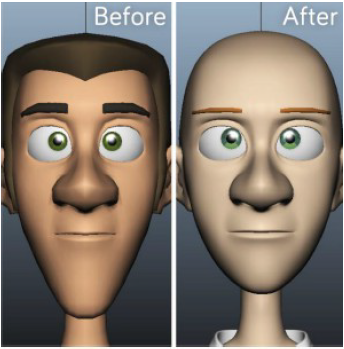 What was the technology involved in the creation of the short (render, software, hair system, etc)? 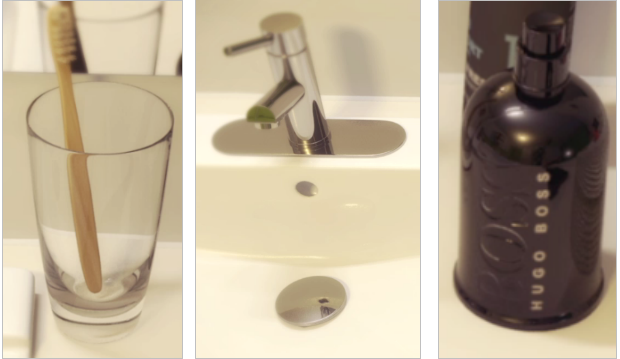 Mental Ray's architectural materials are good for cool a realistic look. 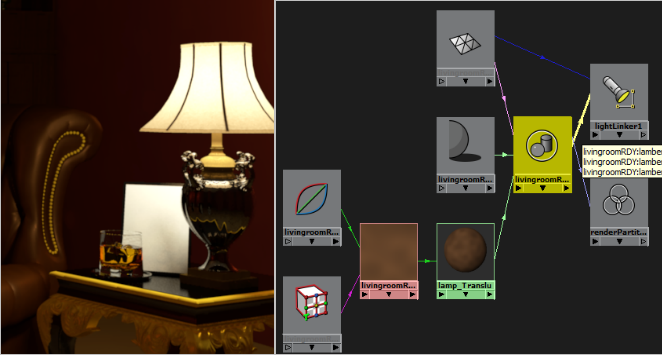 Another example of Mental Ray Area light and shadow transparency node use. Any advice for animators that want to start production of their own short? Keep it simple: Especially if you are alone, it is hard to find the line between challenging yourself and putting the bar too high. Find a subject/story that get you really engaged. So you don't throw everything by the window some months down the production. We thank Florent and Xin for this interview and hope to see more works from them in the future! If you want to learn real character animation taugh by professionals in the industry, come apply now! Today AnimSchool announces Marnie 2.0, a new version of Marnie with mix and match outfits, like the ones shown here, and other rig and model improvements. Using AnimSchool Picker, students can turn on and off entire costumes or individual parts. You can even make her barefoot, since she has poseable toes! 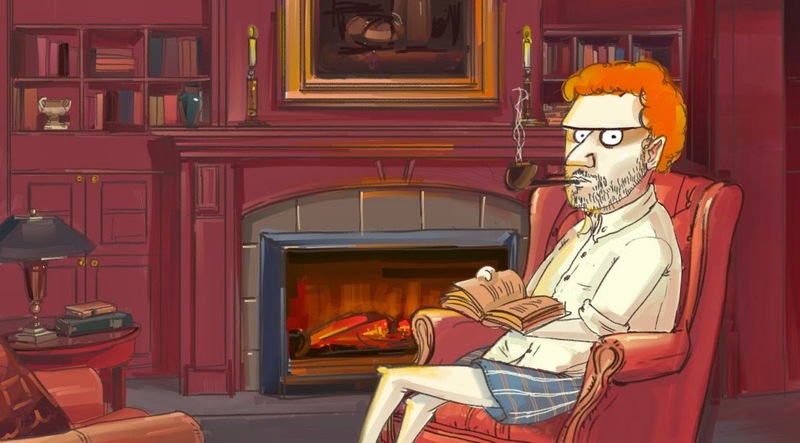 AnimSchool specializes in appealing characters, from our world re-knowned "Malcolm" character to Coach to Scout. Students have been using Marnie 2.0 in their animation assignments this term, and enjoying the many clothing options. Marnie is exclusively for AnimSchool students. To use Marnie and learn from our amazing instructors, apply to be an AnimSchool student. 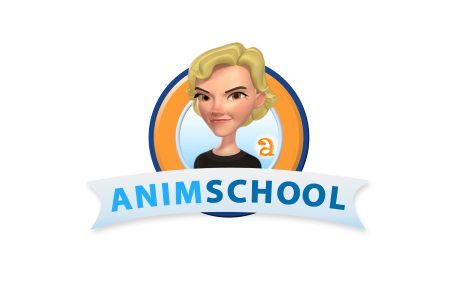 Come join the hundreds of students and dozens of world-class instructors at AnimSchool! 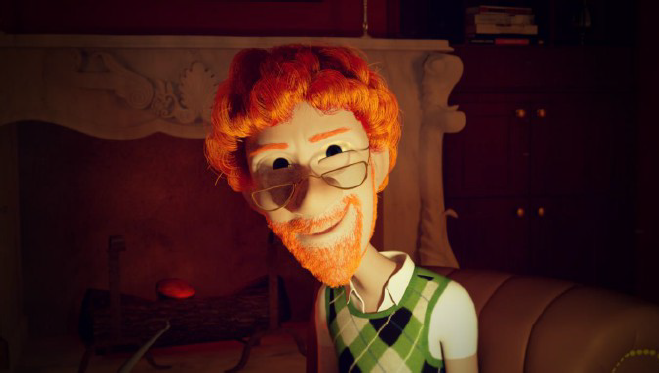 Today our interviewee is AnimSchool Student Andrew Stovesand. 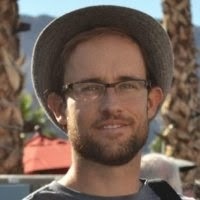 Andrew is now working as a character animator at Moonbot Studios. Hi Andrew! Can you share a bit about yourself and experience with animation prior to AnimSchool? Hi there, yeah for sure! Prior to Animschool most of my animation experience came from working as a Maya generalist. I did a lot of camera animation at a prior studio and that really helped me become aware of the graph editor and how it works. I had a few 11 Second Club attempts, most of which I am not super proud of (haha). Also I made a short animation while I was in school. I also like to paint and am very inspired by painting. Somehow I think they all link together, I feel like the more I grow as an animator the more I grow as a painter/artist in general and vice-versa. Your facial performance shot is very appealing - mind to share your process with us? Cool, thanks! Yes, that shot was fun. I knew right away when I heard the sound clip that it was the one I wanted to use. I mean, if you get a good sound clip where you can see the character easily in your head, then things fall together much more smoothly. I sketched a bunch for the shot and I believe it was Stewart who taught that class, he had us spell out the subtext for the shot which helped me get into her mindset. I also shot a bunch of reference of me and my wife acting, I got a lot of good ideas from that. I knew right away how I wanted her to start off in the shot but transitioning her to the end when she blows up was really the challenge. Andrew's sketches and notes for his facial performance assignment (click to enlarge). Your character performance assignment features two animated characters and a complete modeled set. How many hours per day did you work on this shot to get it done in time? Ha, yes that had some love put into it. My generalist background helped me there. I can model basic stuff pretty quick, so once I knew what I wanted I modeled it in there fast and kept updating as I would go along. Once I see something working in a shot and it inspires me, I feel like nothing will stop me from getting it done. I did spend a lot of time on that shot, and this is where getting laid off had its benefits. Haha! Back to the question, I think I worked a couple hours a day give or take on that one. 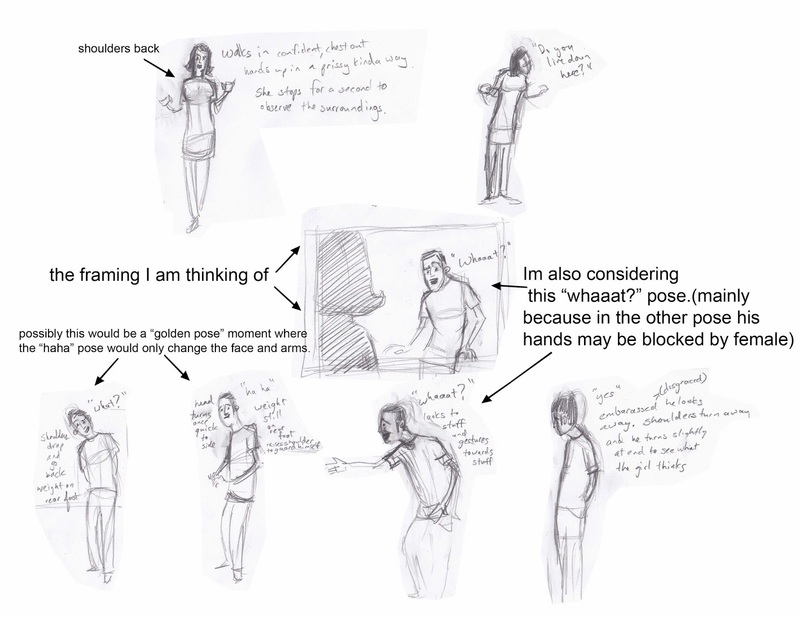 Andrew's sketches and notes for his character performance shot (click to enlarge). 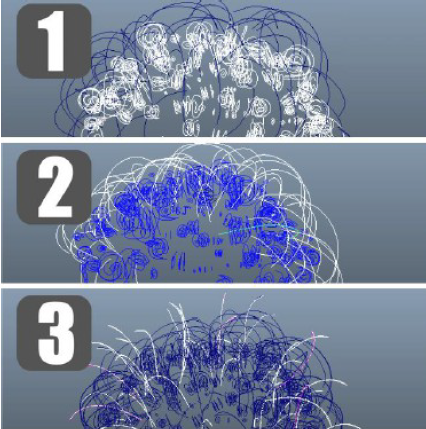 How do you think your skills as an animator evolved since you joined AnimSchool? Wow, great question. The biggest change for me, even after working in the industry for a few years, was getting it through my head that it really does take a lot of work and time to make quality animation. Honestly, it was a relief once I could do this. It kept me from being way to hard on myself. I mean really, anyone who has no experience would not think it takes so many hours to make something move in a pleasing way. We take it all for granted, don't we (I mean isn't this what the whole industry is trying to get the public eye to see?!)? So really the biggest change was learning how to respect each step of the animation process (planning, reference, blocking, splining, polish) and the amount of time needed to do each one well. Lastly, do you have any pointers or tips for your fellow animation students that are struggling to get their shots the way they want it? Ok, yeah... Well, one really simple saying that Thom Roberts said in my very first Animschool class was "kill your babies! ", meaning, be willing to start fresh and delete something that just isn't working. For example, the way the character is turning his/her head bugs you and you can't figure out why? Kill your babies. I find this also applies a lot to simplifying keys. So many times I realize I just needed to get rid of a few keys and it cleans up a movement. I still am amazed when this happens. Killing your babies is not easy and still difficult to do, but usually I find it always helps (that sounds terrible)! Thanks Animschool for all your help and for having me! In today's clip instructor Bill Robinson gives us tips on how to develop a character based on references. He also tackles on how to build basic perspective for your characters. Enjoy! AnimSchool offers extra classes each term for it's students. This is a clip from the Character Design and Drawing class with artist Bill Robinson. Go check our full list of courses and apply now!